Ah Destiny, you cheeky devil with your level caps and your loot grinds. It's weird, really, just how much we love it. The puzzling and the questions that always fill Reddit threads, forums and social media are part of the mystique and intrigue that has always, and will continue, to shroud Destiny. And the same can be said for Destiny 2: Forsaken. People are already wondering how to get from Power Level 500 to 600 in Destiny 2: Forsaken, along with wondering what the Forsaken soft level cap is - or even if there might be two. Read on for our tips for boosting your Destiny 2: Forsaken Power Level beyond 500. Just in case you're new to the lingo that surrounds Destiny 2, a soft cap is where you'll suddenly stop progressing through the Power Levels at alarming speed and boosting your current figure with every new blue weapon, pair of gauntlets or shiny new outfit. In Destiny 2: Forsaken the soft level cap is set at Power Level 500, which you'll probably hit around the end of finishing the campaign, with a side quest or adventure slotted in between the main missions. It's here that you'll notice that your legendary gear drops will be capped at 500, so you'll need to start looking for other ways to get gear, aside from rinsing the same old Lost Sectors in the EDZ. Unfortunately, there are rumors of a second Destiny 2 soft level cap at 540, as at the time of writing, no-one has managed to climb beyond 540 - despite that Destiny 2 hard level cap sitting at a lofty, lofty 600. It may well be that the Destiny 2: Forsaken Raid will start dropping gear and weapons beyond 540, but we'll have to wait until that drops later on this week to find out. Rumor suggests that the normal raid will drop +5 loot up to a level cap of 580, with the prestige raid dropping loot leveled up to 600, but dear me that's a quest for only the best Fire Teams. Don't fret though if you're staring at your 500 Power Level and fearing the grind, because there are ways to guarantee that you'll leap up the rankings a little quicker, but you'll need to do a few specific things in order to make sure you're getting the highest level loot possible. 1. Look for activities that reward you with "powerful gear"
Your Director is usually your best friend for feeding you information as to how to be a better, stronger (occasionally faster) Guardian. Check the various activities and see which ones are marked with a kind of golden circle. Hovering over these will notify you that they reward you with "powerful gear" upon completion. Powerful, you say? Color me purple with intrigue. 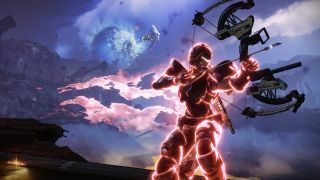 These will range from play five Crucible matches to completing activities in a certain area, and will include activities like Strikes, Adventures and achievements in Crucible and Gambit. Of course, a lot of those golden activity nodes will be tied to the various weekly challenges on offer throughout Destiny 2: Forsaken. Weekly Challenges are spread across Flashpoint, Crucible, Gambit, Strikes, Nightfall, Petra's Dreaming City Challenge pursuits, and more. Just keep your eager loot earning eyes on your Director and get playing Guardian. Another brand new element for Forsaken is the concept of Wanted Bounties. Our new BFF Spider will task you with hunting down escaped convicts from the Prison of Elders, exploring Lost Sectors, and working your way through Adventures. Not only will it potentially earn you gear rewards, you might even get the Lord of Wolves Exotic for your trouble. Collect a Wanted Bounty from the Spider in the Tangled Shore, buying them using Ghost Fragments - resources that you'll get from doing various tasks in the Tangled Shore, like opening region chests, completing Lost Sectors, going on Patrols, Adventures, participating in Public Events - particularly Tangled Shore Heroic Public Events - and taking out high value targets. Then it's just a case of hunting down the Wanted criminal described in the bounty, taking them out, collecting the loot and then going into your inventory to manually redeem the Wanted Bounty. The more expensive Wanted Bounties - those that cost several Ghost Fragments - will reward you with more powerful gear than the cheaper ones. Prime Engrams are brand new for Destiny 2: Forsaken, and are Powerful Engrams that you basically have to earn a special way. They take on a similar appearance to Legendary Engrams, but they will need to be taken to the Cyptarch in the Tower to be decrypted. You'll only start seeing Prime Engrams drop after reaching Level 50, and you'll actually receive your first from the Cyptarch himself. After that you'll start having a chance of seeing them drop when you defeat powerful enemies or complete Crucible matches. However, in order to have that chance, you'll need to have the Prime Attunement buff, which you'll get when you crack open that first free Prime Engram. It seems you don't need to have the buff to see them drop, but it heightens your chances. Obviously it's still early days for Destiny 2: Forsaken, so we're still trying to figure Prime Engrams out. Once you start hitting levels of 510 and beyond, it's time to work out what's going on over at the Dreaming City. It's here that's home to your highest level world enemies, and the potential for the highest level loot to boot. Petra's Weekly Challenge pursuits are particularly good for nabbing you some purple Legendary Engrams, including the Ascendant Challenge, which changes weekly and gives you an item that opens up new platforms and portals within the Dreaming City. However, it's worth noting that the online murmurings suggest the level cap for the Dreaming City is sitting somewhere around 560, so if you're looking to hit 600 you're going to have to aim high - squarely at that prestige raid. While the majority of the above can be done repeatedly to make sure you're working your way up the Power Level ladder, there are a few post-story Forsaken quests that are one hit wonders. Take a look at the below, the majority of which you'll pick up when speaking to the Tower vendors after completing Forsaken's storyline.